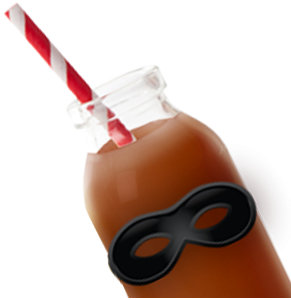 Halloween Treats | Winners Drink Milk! A witch’s cackle at midnight, full moons and black cats are legendary symbols of the most spine-tingling eve of the year– Halloween. When planning your Halloween party, think about healthy snacks. It doesn’t have to be all about candy, or even food for that matter– I’ve used crayons as party favors and even to hand out to Trick-or-Treaters (Come to think of it, I hope no one ate them…surely not.). However, the tried and true trick to your successful party is the food. And cheese, either by itself or in a dish, is the treat that will scare up screams of delight. People enjoy food cut into special shapes. This is so easy to do using cheese slices and your holiday cookie cutters. I’ve done beautiful platters of cheese cut into a variety of leaf shapes using several different cheeses. Today’s cheese case at your local grocery offers a good selection of sliced cheese types making it super easy to prep your party. Tip: Keep the cheese scraps for decorating sandwiches or use them later for cooking or snacking. 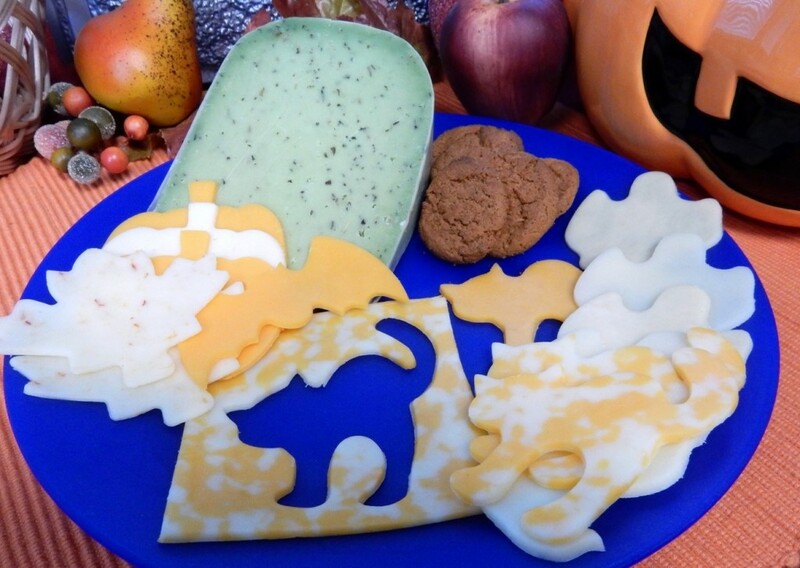 I used Colby-Jack, cheddar, provolone and pepper cheese for these Halloween cheese cut-outs. 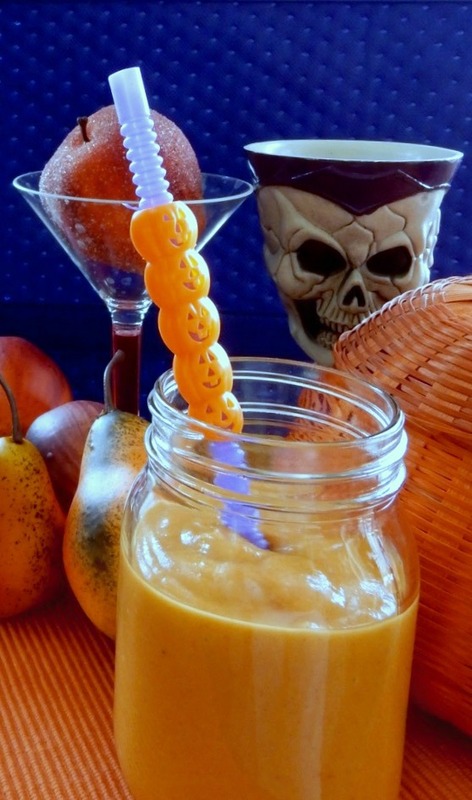 Another go-to Halloween treat is a spooky smoothie! Smoothies are always popular and these two will be hits in your home. 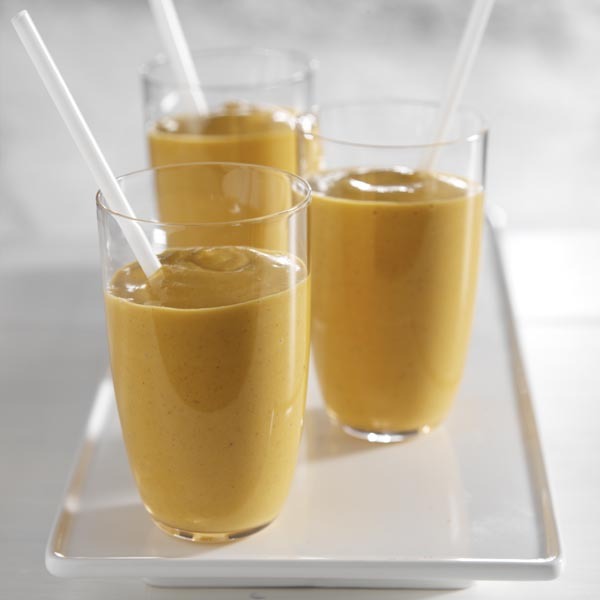 Canned pumpkin has great texture for smoothies and easily takes on other flavors. 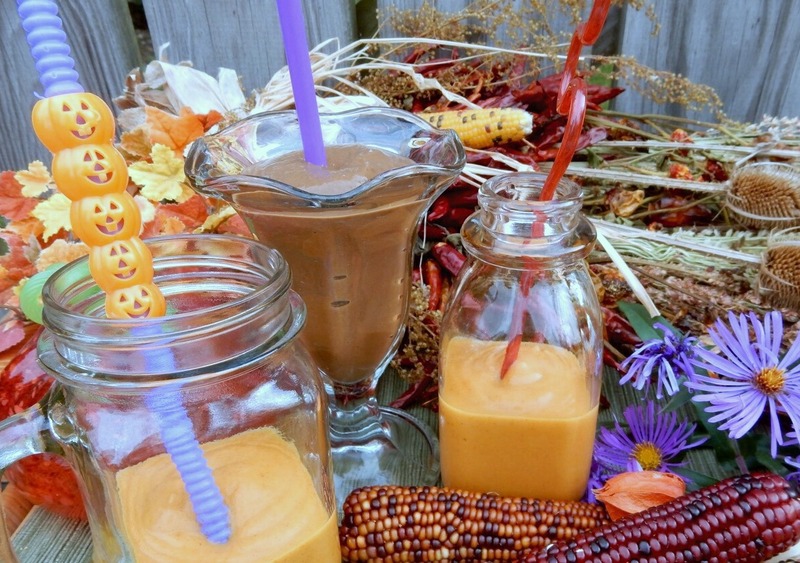 Try the Pumpkins and Monkeys smoothie (recipe below) using vanilla yogurt, pumpkin and a banana. You can also add a tablespoon of cocoa to this recipe for even more flavor. I used dark chocolate cocoa. Fall is the time for apples and apple cider, and pumpkin flavors pair nicely. For the smoothie picture below, I used 3/4 cup vanilla yogurt, 3/4 cup canned pumpkin, 1/2 cup apple cider, 1 tablespoon apple cider vinegar, 1/4 teaspoon ginger and 1/4 teaspoon cinnamon. Blend all ingredients and serve chilled. Finally, Chocolate milk is known as nutrition in disguise because it has all the vitamins and minerals in regular milk. It is the official drink of Halloween, so be sure to have plenty for your party!